A tumultuous age brought forth by the arrival of black ships. A pack of wolves ran through the capital as it was slowly covered with dark, ominous clouds. once more like a bloody wind. "First Unit Captain, Okita will slice them up!" "Good! Start off with ten! 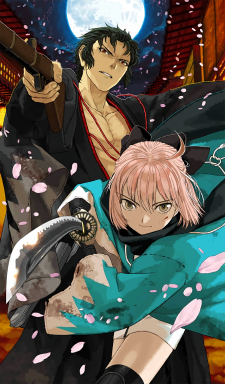 And quit coughing up yer own blood, Okita!" This CE increases Party Attack during GUDAGUDA Meiji Restoration: Entire party's Attack increased by 50% (MLB: 100%); this effect persists even if the Servant holding the CE is defeated. This page was last modified on 30 March 2019, at 15:58.